American chestnuts still grown in forests of the eastern U.S., mostly as sprouts from old root collars that almost never reach reproductive maturity due to the continued presence of chestnut blight. Photo by Douglass Jacobs. A recent study by U.S. Forest Service, university, and state agency researchers provides baseline information on contemporary populations of American chestnut needed to support restoration of the tree to the forests it once dominated. Biologist Harmony Dalgleish from the College of William and Mary served as lead author on the research published in the journal Forests, with co-authors that include Forest Service research geneticist Dana Nelson, Virginia Information Technology Agency resource scientist John Scrivani, and Purdue University forest ecologist Douglass Jacobs. In addition to evaluating the current distribution and abundance of American chestnut, the researchers reviewed research to provide input on the effects of genetics and climate change for restoration efforts. Before the 1920s, North American forests were dominated by American chestnut trees that grew to giant sizes, feeding wildlife and livestock and providing shade and timber. Beginning in the early 1900s, a lethal fungus known as the chestnut blight started moving across the species’ range, killing an estimated 3.5 billion American chestnuts by the mid-1940s. American chestnut trees still exist in forests, mostly as small stems sprouting from old root collars, but these almost never reach the stage where they produce flowers and seeds. Though the blight did not cause the total extinction of American chestnut, the tree was extirpated from the forest canopy, rendering the species functionally extinct in present-day forests. Since the discovery of the blight, different groups have focused on creating a blight resistant American chestnut, either through inter- and intra-species breeding programs, biocontrol of the virus, and most recently, genetic engineering. Because of these efforts, restoring American chestnut to North American forests has become a viable possibility, and researchers have started looking more closely at the species’ ecology in preparation for more widespread restoration efforts. 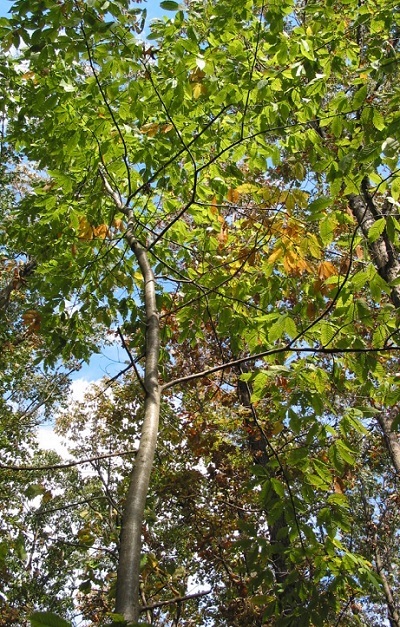 “This research provides baseline information on present populations of American chestnut — where they are and how large they grow — to help determine where restoration efforts will be most effective,” said Nelson, project leader with the Forest Service Southern Research Station and co-director of the Forest Health Research and Education Center based at the University of Kentucky. American chestnut was found outside the historic range in Louisiana, Missouri, Iowa, Wisconsin, Michigan, and Florida, apparently planted there by people rather than occurring naturally. The scientists also reviewed what is known about biological and geographic patterns in American chestnut in relation to climate change and genetics, since both will be important to restoration efforts. They concluded that while climate change could expand the range of American chestnut northward, this migration will not happen on its own due to limited seed production. They also noted a greater genetic diversity in the remaining seedlings than expected, which potentially could provide a genetic reserve for breeding and genetic engineering efforts to develop blight resistant American chestnut seedlings for restoration. For more information, email Dana Nelson at dananelson@fs.fed.us. « Older Previous post: In the Southeast, Who’s in the Path of Smoke Plumes?